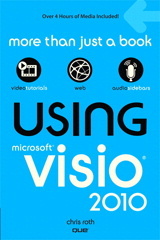 You are here: Home / Visio Content / Shapes / Illustration / Lens Flare & Highlight Shapes – Bling Bling! I’ve come up with some shapes that will allow you to add lighting effects such as lens flares, star-highlights, and other shininess-enhancing effects to your overdrawn Visio diagrams. It’s tough being stuck with a left-brained and right-brained personality. I fully appreciate that people use Visio for real business problems, and that they likely need to earn a living with by producing better network diagrams, BPM flowcharts, customized, automated solutions that link to real-world data. And I’m glad this website has helped people to get those jobs done. You can change the color of the highlights, and you can stack them on top of each other to create additional effects. The first row of shapes above shows different-colored highlights. In the second row, I’ve stacked the colored shapes on top of white white ones. Since the shapes have a degree of transparency, the white shows through, enhances the color, and changes the effect. The radiant ray shapes below use a custom line pattern to create a random, sparkly effect. 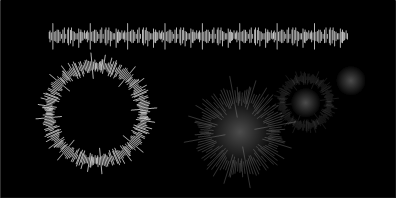 It gets interesting when you combine them with fuzzy-gradient dots and add transparency. You can also change the length of the radiant-rays by pulling on a yellow control handle. The control handle position changes the lineweight of the shape. Since the custom line pattern uses lines that are perpendicular to the pattern, we end up with longer radii…well, just have a look at the download to see what I’m talking about! I combined several of the shapes together to make a few lens-flare shapes. 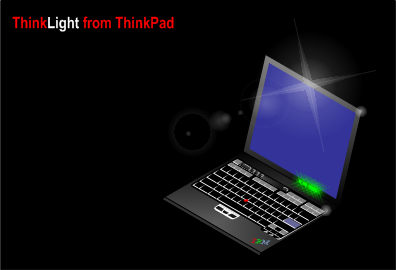 You can see one applied to the Thinkpad shape below. The shapes live happily togethern in a single 1D group, so you can quickly and simply pull on a handle to change the length and direction of the flare effect! Note also how the green fuzzy-star highlights add Bling! to the status lights just above the keyboard. And if you get into the office really early, you might just get carried away and have too much of fun…perhaps an enhancement to that nameplate on your cubicle wall! Note that use of custom line patterns on that overcoat!